An avenue to explain why I cut my own bangs, along with other mistakes I've made in life. I’m a complete sucker for a man who talks with a different twang. I was having a conversation the other day with a man who hailed from Philadelphia, and it was apparent that his speech was different from mine. It was a perfect mixture of a New York, Jersey, and Boston accent, all rolled into one. That may not be the best description, but I was smitten as soon as he opened his mouth. His voice oozed blue-collar, neighborhood guy from around the way, who lived and died with the Eagles. And I’m pretty sure he was a total caregiver who loved his momma, too. I was pretty much mush in hands. A man with an accent is right up there with bacon, chocolate, and steak in my life- something I hold very dear, because they are all tasty and delicious. I can walk past a guy in a bar and think, “Oh, he’s kinda cute”. But when he opens his mouth and sounds like Sean Connery (this is the tasty and delicious theme coming back), I reconsider the taboo of women proposing to men. It’s as if a man with a distinct accent has something far more interesting to say to me than this other dude from the good ‘ol Midwest. DISCLAIMER: I am from the Midwest, so I have complete authority to make fun of my own people. While we are known to have the best speech of any group of people in the United States, our accents don’t do anything to entice anyone. I have never felt weak in the knees for any man just because he spoke perfect English and exercised proper grammar. BRITISH ACCENT: Listening to some one with an English accent somehow forces you to believe and do everything that they say. If your cousin Johnny tells you in his Michigan accent that soda (excuse me, pop), is not good for you, you’ll brush him off while you sip on your Coke. But if Daniel Craig looks you deep in the eyes and says “Michelle, you know that soda is not good for your health, you shouldn’t drink it”, you’ll throw out the rest of your cans and swap it out for water. AUSTRALIAN ACCENT: If you met a guy at Jazz Night who made you think of Chris Hemsworth when you closed your eyes, you’d be done. Not only would he be automatically rugged and a man’s man due to the sound of voice, but you would probably trust him to save you if you were attacked by a cheetah. You’d ignore his calls on purpose, in hopes that he will leave you a voicemail, which is bound to be shared with your friends over a million times. NEW YORK: Prior to me falling for Motown Philly guy, I was gushing over a New York dialect. When I first traveled to the city that never sleeps, I couldn’t wait to run into a guy with a Yankees cap, Timberlands, and called me “shorty”. When I think of the term “game” in the dating world, I feel like New York men had it. It’s as if everything they say is an attempt to get you to fall in love with them. This is evident from the overabundance of hand gestures and sharp speech when they’re talking to you. When I got my first “shorty” cat call, I tried to play it off like I was a cool, but that didn’t work too well. My face turned beet red, and any man with a NY twang was bound to get me. Although I’m glad I grew out of the need to be someone’s “shorty”, I still have a little soft spot in my heart for the vernacular of a man from the Big Apple. 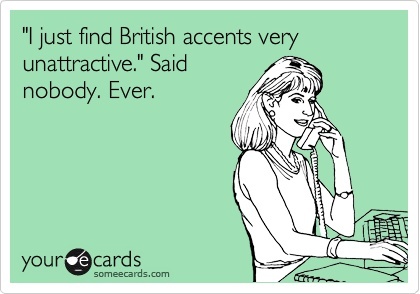 Am I being somewhat stereotypical when it comes to the feelings I have towards men’s accents? Most likely. But why be mad at being categorized as instantly hot because of the way you say “bottle”? There are various traits that attract certain people to others, like physical build, bank account balance, and number of Instagram followers. I just so happen to be aroused by intelligence, wit, and the fact that you sound just like Idris Elba. It would be fantastic if you looked like him as well. It would be better if you WERE him.